Among my grade school summer memories, a particularly interesting one has me sitting by our doorway along our bustling market street, armed with a styrofoam box containing ice candy and a tin box containing the days earnings. Initially, I made mango ice candy to snack on, but with my grandmother’s encouragement, I tried my hand at making some for selling. Eventually, we added more flavors to include red monggo and pinipig set in a coconut milk base, but my favorite was always the ripe mango ones. Mango Ice Candy – Still my #1 favorite. Decades have passed since that summer, but I still make mango ice candy whenever the summer sun heralds the arrival of ripe mango season. It’s quite a bit of effort, tying those little plastic bags, especially considering they get wiped out in a day or two in our home, but nothing beats opening the freezer and pulling out a refreshing, icy, fruity, creamy frozen treat. Despite selling ice candy as a kid, this version that I prepare for home consumption isn’t really for selling. For one, it comes up pretty expensive, compared to your usual ice candy. If you’re planning to make some for selling, adjust the amount of water and sugar. It will come out less creamy, but it still makes for a good summer treat. Wash and slice the mangoes, separating the cheeks from the pits. Run a melon stringer through the cheeks and the flesh sticking to the pits to create short, 1-2cm long strips. Mix all the ingredients together. The mango juice is optional. 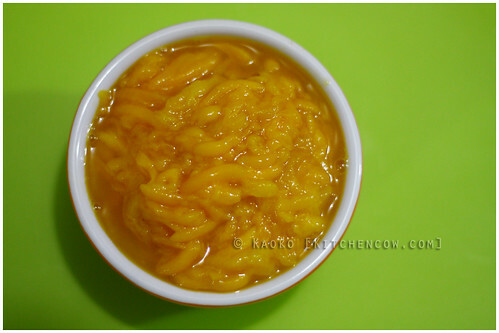 Ideally you get enough of a mango taste from the fresh mangoes, but a couple of years ago, I started adding juice as well for added mango oomph. Using a funnel, pour enough of the ice candy mix into ice candy plastic bags, leaving one to two inches free. Tightly twist the top of the bag, pushing air out while creating a thin strand of plastic. This makes the top easier to knot. If you have popsicle molds, those will work as a good replacement to ice candy plastic bags too. Freeze until done. One batch makes around 30 to 32 ice candies, depending on how much you put in each bag. Good idea! Parang mango sago! 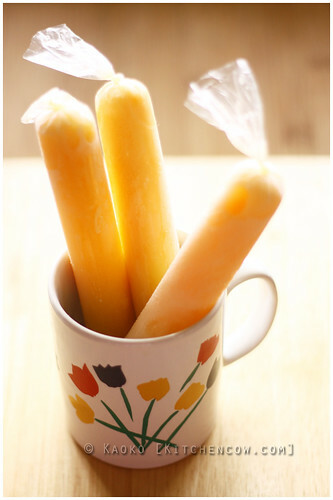 Was just thinking of making a batch of home-made ice candy for the kids, so this post will come in handy! Thanks for sharing! I shall try to make this! I hope you and your kids like it as much as I do. I already have ingredients for a fresh batch waiting to be made tomorrow 😛 I love it that much. Hoooou! I didn’t think you’ll still add milk in it! I guess the taste is closer to mango milkshake, yeah? I like the idea! I should try that next time. We used to do this with my lola so we could earn some money. In the end, kami kami rin lang ang kumakain haha. Ahh, I want some now. Nyahahahahahaa! At least walang talo. Kung di man kumita, at least busog kayo. Sorry. Unfortunately, I don’t, although I remember my grandmother used to make some using coconut milk and red mungo beans and / or toasted pinipig. That was really yummy.